Travel is thought of as an outlet for relaxation, education, and a chance to escape the mundane, but research as recent as 2016 suggests that travel has several deeper benefits for families and their relationships. Just as couples need time together, families need quality time dedicated to growing stronger as a group, not just as people who eat dinner and do laundry together. Does this ring any bells in your life? Like most of us with busy lives, the answer is yes. Which means it is time to book in some well-earned family time away from the electronic and daily distractions of modern life. One type of trip that we have seen grow in popularity in recent years at the Mallard Mountain Lodge is the multi-generational family trip. Each year, more families are starting to recreate in the backcountry together, and kids (and grandparents) of all ages are starting to join in on these adventures. Here are 3 reasons your family should take a long weekend (or at least few days) away together at our backcountry ski lodge. 1. Here, the snow waits for you. There’s no rush in the mornings. One of the least enjoyable parts of a ski vacation is the gondola or chairlift lineups, closely followed by “crowded slopes” and the “lines for lunch”. Planning daily activities for your family is enough, but in a resort you also spend time trying to second-guess the schedules of 1000 other families, too, just to avoid spending all day in lines. One of our guest’s favourite things about our private lodge booking is that there is no-one else to steal your powder. Even when the lodge is full, there are only ever 8 guests here at one time – compared to the 30-50 guests at other popular backcountry lodges. The Mallard Mountain Lodge is centrally located in the Mallard Valley, one of five in the Punchbowl area within our tenure. This makes it easy to ski directly to and from the lodge any time during the day to change clothing, swap out ski partners, meet your guide, or have lunch or take off your boots and enjoy your second coffee of the day. It’s like being in your own private ski resort. In most cases, guests will be having so much fun that they will spend the full day away from the Lodge. If you do want to stay out all day, your chef in the fully-catered package will have a selection of to-go lunch items and snacks prepped and ready to go after breakfast. Our tenured land of 18,885 acres is home to some of the most diverse backcountry skiing, snowboarding, or even snowshoeing terrain in North America. Whether you’re a beginner, intermediate, or advanced, guests can ride or ski a different line every day. 2. One set price. No hidden extras. Privacy guaranteed. 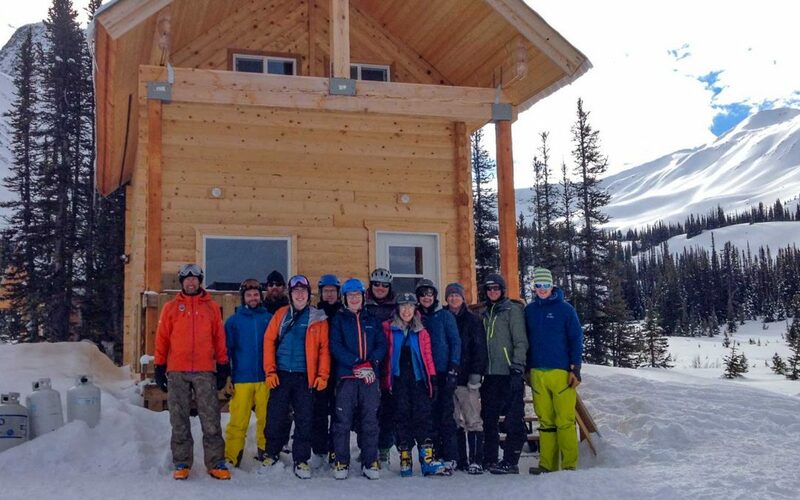 The next major hurdle we hear is that most backcountry lodges have a minimum capacity of 12 to 20 guests in order to have private use, some even more. The logistics of pulling together that many people, as well as the cost to book out an entire lodge becomes increasingly prohibitive. With group configurations anywhere from 2 to 8 at the Mallard Mountain Lodge, one or two families can easily book out the lodge and have exclusive use of it for the length of their trip. Spending time in the backcountry with family can be some of the most rewarding experiences. With multiple configurations and packages, Mallard Mountain Lodge offers a unique opportunity for families of all ages to enjoy the backcountry together in a remote and relaxing environment. 3. Ski as little or as much as you like. The lodge is never far away. With often decades of age differences among family members, it can be difficult to book activities or tours, as skill and fitness levels can vary dramatically. Over the last few years, we’ve heard from our guests that this can be a huge challenge for families looking to recreate together. Having private use of the Mallard Mountain Lodge allows you and your family to make it your home for the week, where you can relax and enjoy the beautiful landscapes and company around them at your pace. These types of trips are extremely special times for families, it is a time for reconnecting and spending time together away from the distractions of life at home. With the options for fully-catered or self-catered packages, as well as fully-guided or self-guided experiences, families can relax and have all cooking and planning taken care of. Or have full use of the kitchen to themselves to enjoy cooking at their own leisure. Learn more about a winter ski vacation at the Mallard Mountain Lodge or take a look at our Rates and Dates page to start planning.